This title reexamines and reconsiders the model of empirical research underlying most empirical work. The goal is neither a whitewash nor capital punishment, but rather it is to reform and mold empirical research into an activity that contributes as much as possible to a rigorous understanding of society. Without worrying about defining science or even determining the essence of the scientific enterprise, the goal is one that pools together logical thinking and empirically determined information. One of the fundamental issues to be addressed in this volume: Are there questions currently studied that are basically unanswerable even if the investigator had ideal nonexperimental data? If so, what are the alternative questions that can be dealt with successfully by empirical social research, and how should they be approached? In the chapters ahead, it will be important to keep in mind this doctrine of the undoable. Of course, one cannot simply mutter "undoable" when a difficult obstacle is encountered, turn off the computer, and look in the want ads for a new job—or at least a new task. Instead, it means considering if there is some inherent logical reason or sociological force that makes certain empirical questions unanswerable. There are four types of undoable questions to consider: those that are inherently impossible; those that are premature; those that are overly complicated; and those that empirical and theoretical knowledge have nullified. Stanley Lieberson is Abbott Lawrence Lowell Professor of Sociology at Harvard University. A Fellow of the American Academy of Arts & Sciences and a member of the National Academy of Sciences, he was a past president of the American Sociological Association. 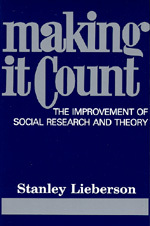 He is the author of MAKING IT COUNT: The Improvement of Social Research and Theory and PIECE OF THE PIE: Black and White Immigrants Since 1880.